Continuing with the updates from last month, here are yet more photos. While Lila’s school requires a uniform, Logan’s doesn’t. 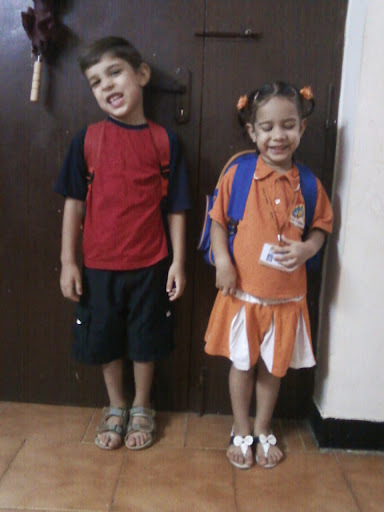 They believe the children should come to school wearing what they are most comfortable in. 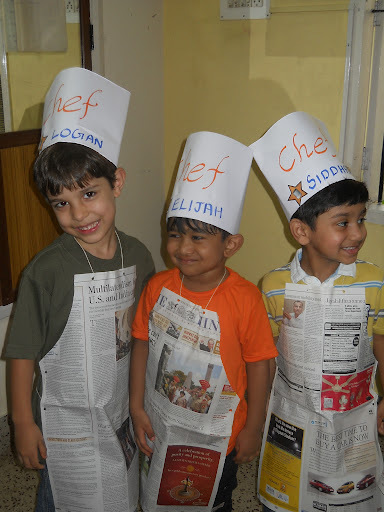 They do have some special occassions that the children dress up for, like certain Indian holidays. 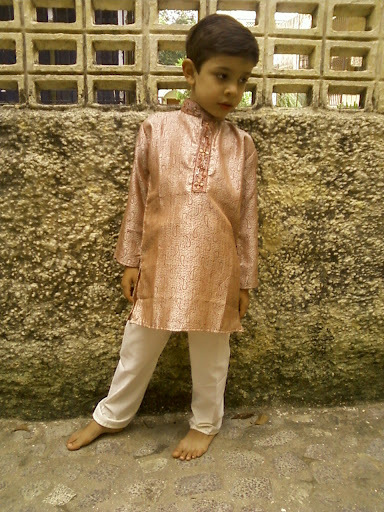 Here is Logan in his traditional outfit. He has already worn it 3 times this month. Ha. I only got him one since he won’t wear it anywhere but school, but I bet they are getting bored of seeing the same one all the time. Ready for special holiday activities. Of course the big holiday this month was Independence Day. Here is Logan in class the day before. And here is Lila ready for her Independence Day activities. 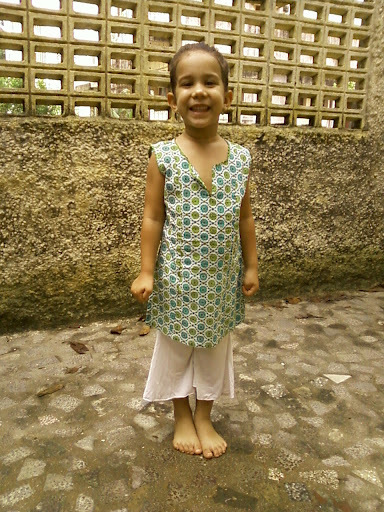 This is her first time wearing a traditional top. 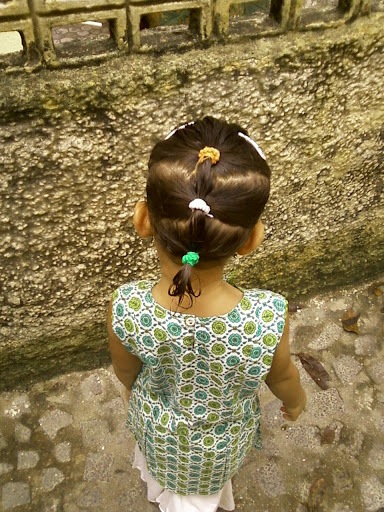 And I did her hair in the colors of the flag. 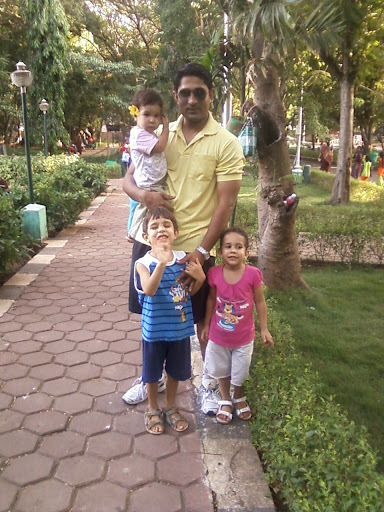 On the actual Independence Day, we rested at home and then went for a family outing to the park in the afternoon. 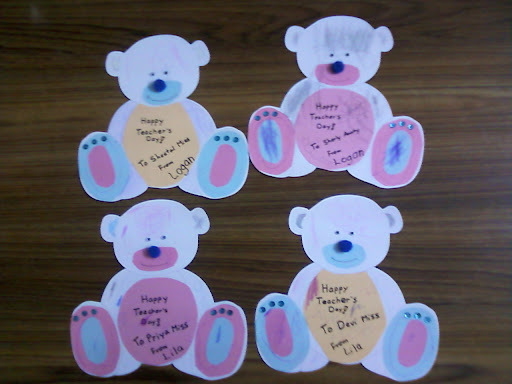 September 5th was Teacher’s Day, so I helped the kids make cards for their teachers. 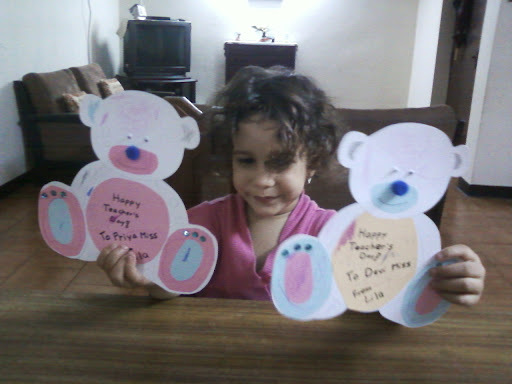 My mom sent them this teddy bear activity and it was perfect to use for cards. While I had to do most of the work (of course), they did the coloring and drew designs on the cards, plus signed their names on them, with a little help. Logan’s cards made it to the school bulletin board. Logan has only been in this school for 7 weeks, but already we see him making so much progress. I had my first PTV with his teacher last week and he is ahead in everything, except writing. Well, that doesn’t bother us. We don’t mind if he goes slower with writing and learns to do it right. 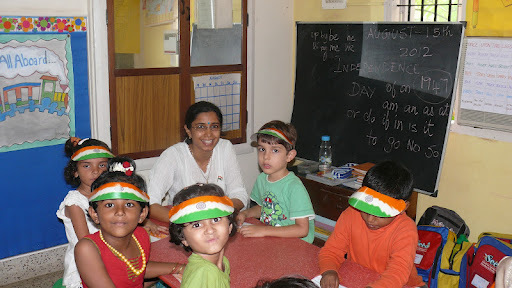 See, here in India, children are required to be reading and able to write two sentences on their own when they enter 1st grade, so they begin learning to write in preschool. 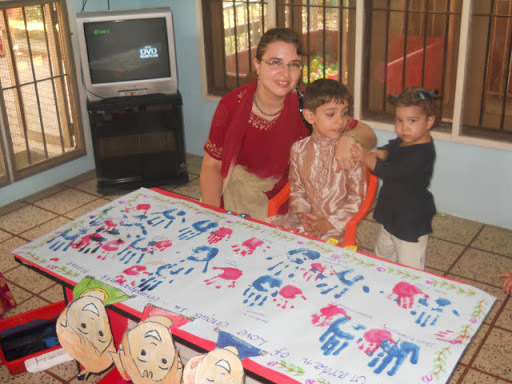 LKG reinforces it and by UKG, where Logan is, they are introduced to cursive. Wow! His difficulties lie in a) desire to learn to write, and b) a lack in fine motor skills. Homework was tough for him at first, but he is getting used to it. I don’t always make him do everything that is sent home. 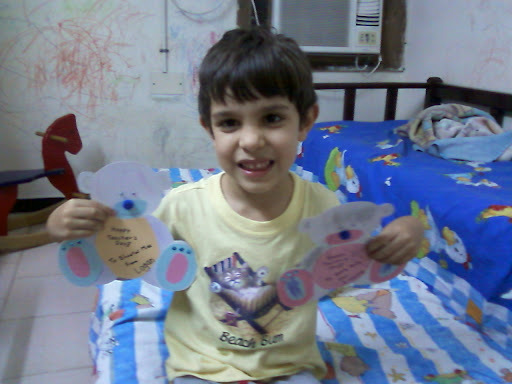 They were giving him a lot because he had two months worth of work to make up in order to be up with his classmates. Now the amount has been reduced. Even the teacher said she doesn’t like to give them so much but she is requred to in order for them to be ready for 1st grade. 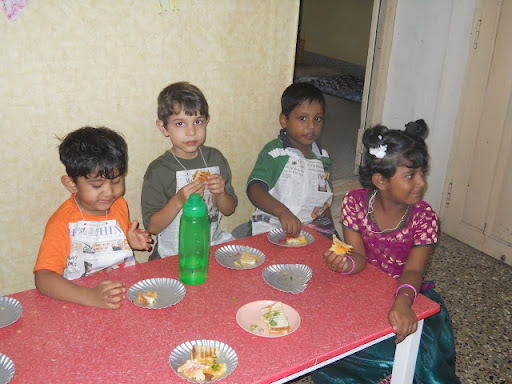 Last week she gave them all a break from writing and planned a fun day of cooking. Logan was so happy, as you can see from the pics. He was especially delighted to not have any homework last weekend. Taking a turn with the mixing. And enjoying the sandwiches afterwards. 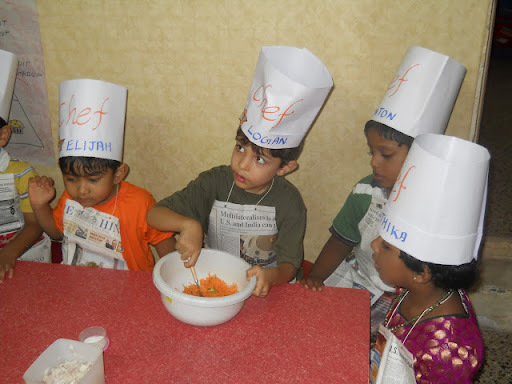 One funny thing: Here children address their teachers by their name first and then they say Miss afterwards. In Logan’s school, the children say aunty instead of miss. Well, Logan calls his teacher Sherly Aunty Miss. Ha. He was used to calling his teacher Miss so he just tacked it on. 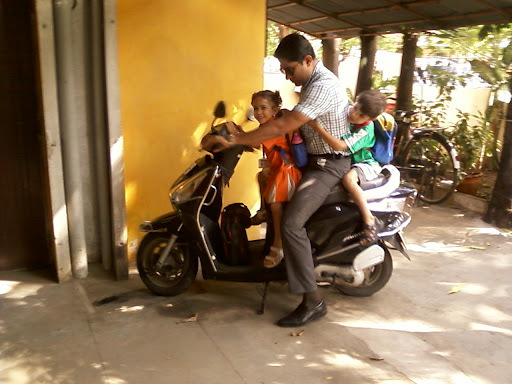 He also used to call the nanny in his class last year Aunty Miss and everyone thought it was so funny. I guess he thought aunty was her name. As you can see, he has a lot of books. 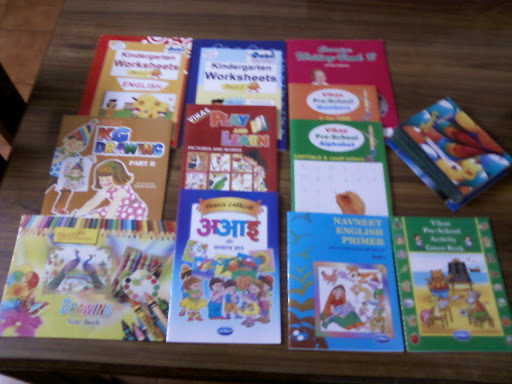 From the top they are an English workbook, Math workbook, cursive and print writing workbooks, an art book, general knowledge, writing numbers, a blank drawing book, Hindi alphabet book, English reader and workbook, plus 4 blank notebooks. 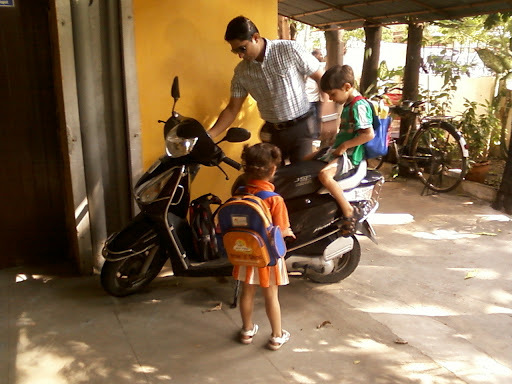 The school also provided a backpack. 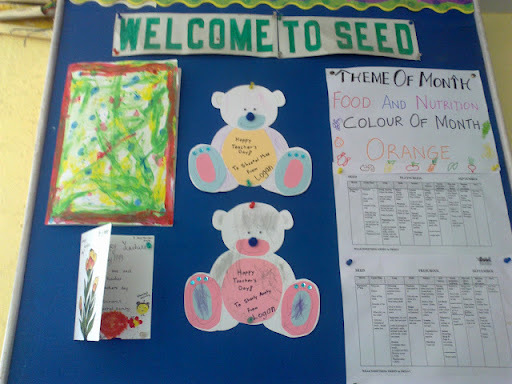 Most of this work is done at school. So far his homework has been the writing and numbers workbooks, reading, drawing, and Hindi, though with the last one I sent a note saying I wasn’t able to teach him the Hindi alphabet and Glad could only help with it on weekends. He was supposed to practice the letters at home but I think they decided to not send it any more. He also often gets extra letter practice in the blank notebooks. As for the reading I was doing with him, we have slowed down with it in order to make his homework a priority, but he is reading so well that even though we don’t get to do it daily any more, he is still progressing. Today he surprised me by spelling all the numbers from one to ten! I had no idea he was learning spelling already. Today I met with Lila’s teacher for the first term PTV. Lila has made excellent progress in every area, except talking in school. 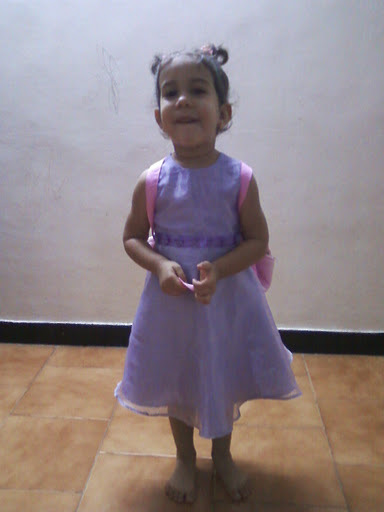 While she is a great (and loud) talker at home, at school she is very quiet and never speaks above a whisper. Only recently did her teachers discover that she has a loud voice. Glad had been out on business and picked Logan up and brought him back to Lila’s school, instead of the other way around. Logan took off to explore his old school and raced up the stairs. Lila knows that she isn’t supposed to go up as her classroom is downstairs (the same one Logan had, with the same main teacher), so she stayed at the bottom of the stairs and politely shouted for Logan to come down. Apparently all the teachers came running because it was the first time they had ever heard her normal voice. Ha. 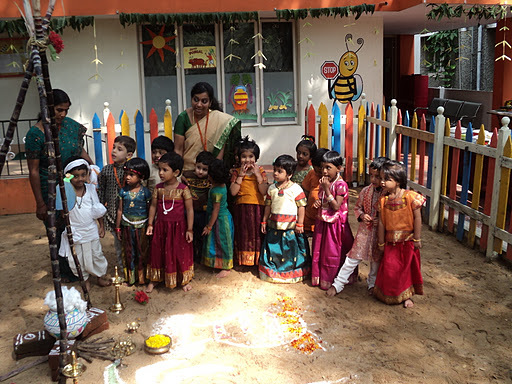 They are preparing for their annual day event at the end of this month, so the kids will be having dance practice all next week and Lila is excited about it. 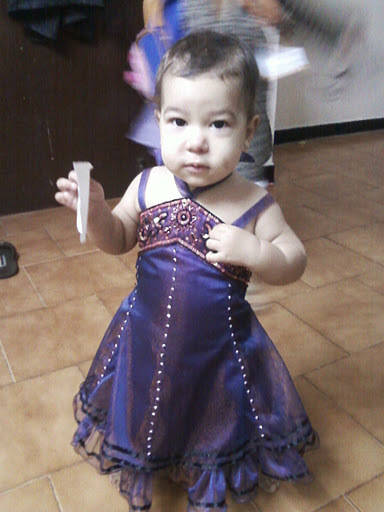 She is doing well with the dancing and enjoys it above all the rest of the activities at school. 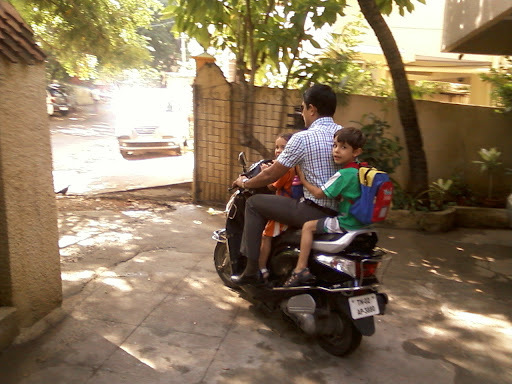 And I will leave you with photos of them leaving for school, taken just this morning. We live in a large house that is divided into apartments and ours is on the first floor. Here they are heading out. 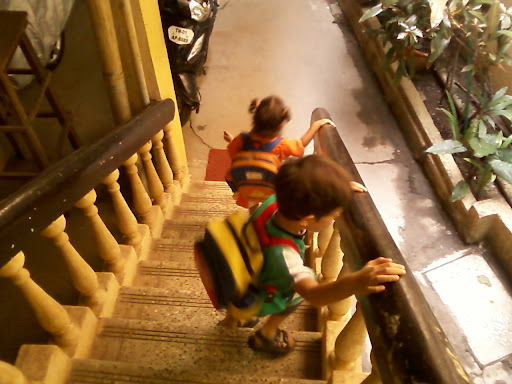 … and away they go. 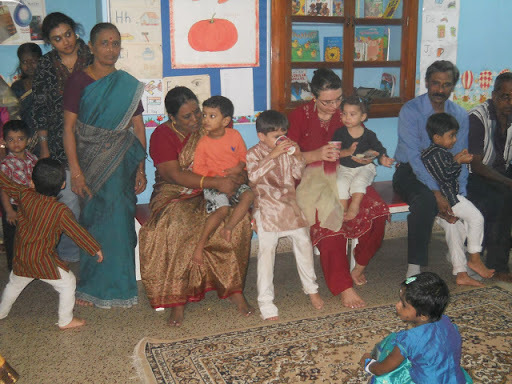 ﻿On friday, Logan’s school held their Pongal festivities. 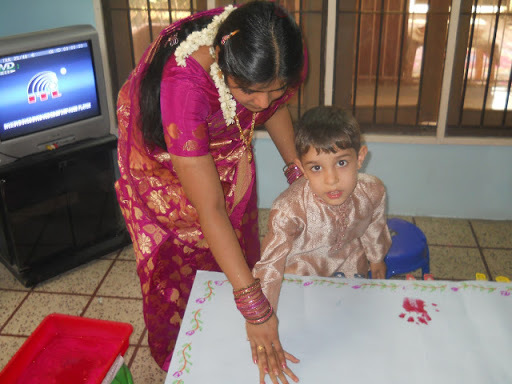 Pongal is the harvest festival and involves a lot of traditions that I am not familiar with, but I got to learn about one of them – the sweet pongal. 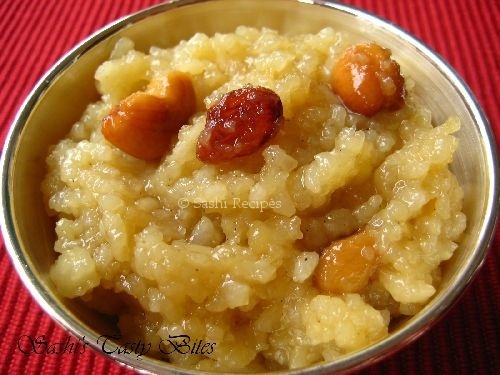 Sweet pongal is a dish made from lentils, rice, cardamom, jaggery, cashew nuts and lots of ghee. It can be decorated on top with cashews, rasins, and/or bananas and is a dish involved in Hindu religious rituals that pertain to Pongal. 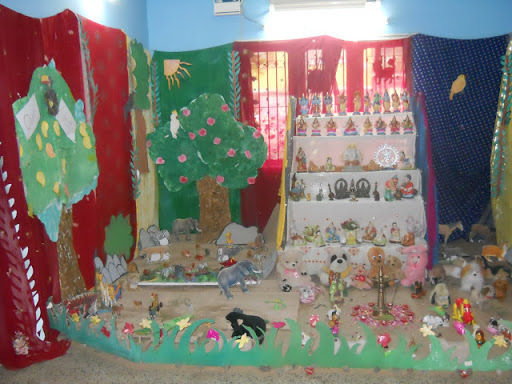 The school likes to hold contests as a way to involve the parents in school activities. There was a Christmas cake one in December which I entered (but didn’t win, boo hoo), but this one was out of my league as far as cooking it was concerned, so I was asked to be one of the ﻿judges. The girls and I arrived shortly after class started, and I kept them outside until the judging began. They were only expecting a few entries and were suprised to get 41 total. We had to judge them on appearance, taste, and whether or not they had provided a recipe, for a possible total of 10 points from each judge. I wonder if anyone got a full 30 points. The results won’t be out until wednesday because monday and tuesday are holidays. Yes, this is one of those festivals that lasts several days. 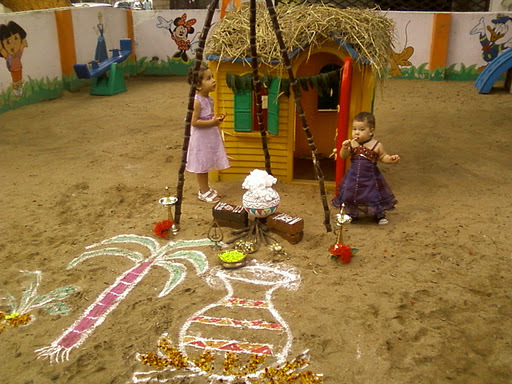 While I was busy with this, Glad kept the girls and they had some of the sweet pongal for snack. It was an interesting experience for me as I had never tasted this dish before, and the fact that I wasn’t familiar with it was one of the reasons they asked me to judge in the first place. They wanted an outsiders opinion and they got it. Ha. Logan’s class in the yard, checking out the setup. Logan is in the back, far left. 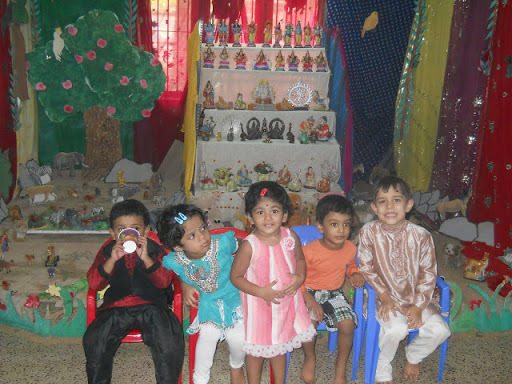 All the children came in traditional outfits. By the end, I started feeling sick from eating all that sugar and ghee. (If you don’t know what ghee is, read this.) Ghee is extreemly rich, and while it tastes good, too much makes the food heavy, but it is a large part of traditional Indian cooking. But I did get one of the cute yard setup. This was supposed to look like a typical farmer’s house and yard, with the cooking being done in the traditional way, over an open fire. Lila and Scarlett checking out the hut. Well, I enjoyed it and so did the kids. Read the links I’ve provided if you want to know more about this festival. 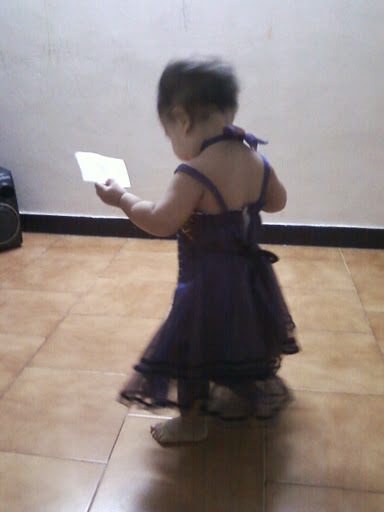 And now a close-up of the girls cute dresses. This was one of her birthday gifts from some of Glad’s co-workers. … and the back. So cute. She’s had this one for a while now and it still fits.